Public Craft is one of two microbreweries in downtown Kenosha, in the midst of a resurgent district filling up with shops, art galleries, and bars. Beers from Public Craft include their PUBLIC Pale Ale, Sweet Colleen’s Irish Red, K-Town Brown Ale, UBER Hefty Weizen, Inkwell Black IPA, Special Porter, and more. Their Tap Room is open Thursday & Friday from 3:30-9:00pm, Saturdays noon-9pm, and Sundays noon-6pm. 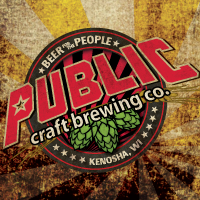 Public Craft is located in downtown Kenosha on 58th Street, just east of Highway 32 and the east end of Highway 50. Highway 158 starts six blocks north at 52nd Street. Within walking distance are tons of shops, museums, restaurants, the harbor, and more.